A longtime favorite in the Far East, Kombucha is a lightly effervescent drink made by fermenting sweetened tea that is quickly gaining popularity here in the United States. Like yogurt, it contains probiotics touted by many as the key to a healthier gut. After making their own kombucha for decades, Jessica and Eric Childs launched Kombucha Brooklyn (KBBK) in 2009 with three flavors of kombucha available in 16-oz bottles at a handful of stores in Brooklyn. Now, Jessica and Eric are making it easy for people to brew their own kombucha at home. 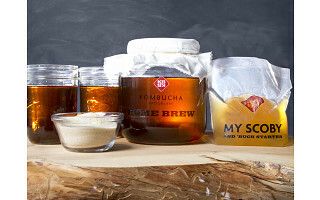 Hand-built in Brooklyn using the finest organic and fair-trade ingredients, KBBK Home Brew Kombucha Kits come with everything you need to get started, including the live culture known as the "SCOBY" which stands for a Symbiotic Colony of Bacteria and Yeast. In the words of our testers, the SCOBY looks a bit “icky,” but it’s a gift that keeps on giving. Every time you brew a batch of kombucha, you’ll grow a new culture, which means you can then create two more batches—or give a SCOBY to a friend so they can get started brewing, too. As long as you keep the culture alive, you can keep making more kombucha. Add a dash of lemon juice, fresh ginger, or experiment with other flavors to create one tasty batch after another. I started drinking kombucha because it tasted great. When I realized just how much my health had improved, I decided I needed to create the best tasting kombucha around and share it with the world! Kombucha Brooklyn emerged from the tinkering and tweaking of my first home-brewery set up underneath the stairs in my Brooklyn apartment. Our recipe of hand-selected black, green and white teas form the base for most of KBBK’s bottled and kegged flavors. I remain totally intrigued by the possibilities of kombucha, and invite you to enjoy what the driven professionals of KBBK have found: a delightful drink that’s as easy as brewing a cup of tea. Hi there current and future brewers! Although we're snowed in on this glorious Friday, we are excited to provide you with the best kombucha kits and customer care you can find! If you have any questions feel free to ask us here, otherwise dive into the adventure of home-brewing kombucha and ENJOY! @Eric does it have to be refrigerated? @Denise Hi Denise, it does not. Kombucha ferments best in the 70-80 Fº range, but you can keep it in the fridge after to enjoy a nice cold kombucha. As it is a live drink, the colder it is the slower the growth, so if you want to go on vacation or stop brewing for a bit, you can put it in the fridge, where it will stay ok to use for up to two months. Remember to store it with at least a cup of kombucha, so it has something to live off while in the fridge! Eric, does it have caffeine? Aaron from The Grommet here. Good question! Ultimately, it depends on the type and quantity of tea you use when brewing. Brewers often recommend using a black tea, but, green tea, white tea and yerba mate also make good choices, and these all contain caffeine. However, because you are brewing the equivalent of about one to two tea bags per half gallon, the caffeine content of each serving of kombucha is lower than you find in a cup of tea or coffee. One thing to note: It is not recommended to use herbal teas. Hi there, thats correct - kombucha usually holds around a third the amount of caffeine as a regular cup of tea. And yes, as Aaron astutely mentions, different teas have different caffeine levels, so if you are sensitive brew with specific teas which have lower levels. Not all blacks are high in caffeine, nor greens low in caffeine, but my recomendation is to make a blend! Black tea blended half and half with Rooibos tea, or Guayusa make awesome kombuchas. It is important to know that when you blend, especially with Guayusa or other herbals, sometimes the culture will die off after a couple brews. So always have a small control brew you can fall back on if your experiment goes south. Here are somethings we love to brew with at the moment: Cardamom, Holy Basil, Chamomile, Guayusa, Rooibos and Hibiscus. You can also use essential oils such as lemon or spearmint oils - just a drop! Can you tell me if there is an additional cost for the Scoby( upturned). You do not have to pay any additional cost for the Scoby. You simply go to their website, enter the code that comes with the kit and they will ship you the Scoby! Hello Aaron, is Kombucha an alcoholic beverage ? Kombucha is a fermented tea drink by definition, so it is always alcoholic. But usually what you brew isn't strong enough to be defined by legal standards as alcoholic - Our kits will brew kombucha under 1/2% alcohol content. @Eric Even though not "defined by legal standards as alcoholic," should an alcoholic keep away from Kombucha? What is the medical community saying? A longtime favorite in the Far East, Kombucha is a lightly effervescent drink made by fermenting sweetened tea that is quickly gaining popularity here in the United States. Like yogurt, it contains probiotics touted by many as the key to a healthier gut. After making their own kombucha for decades, Jessica and Eric Childs launched Kombucha Brooklyn (KBBK) in 2009 with three flavors of kombucha available in 16-oz bottles at a handful of stores in Brooklyn. 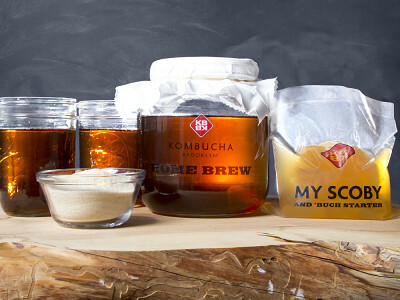 Now, Jessica and Eric are making it easy for people to brew their own kombucha at home.